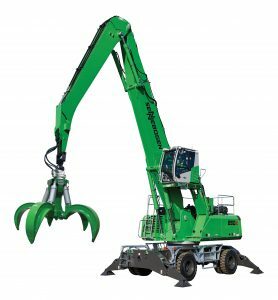 Stanley, NC – Constantino Lannes, President of SENNEBOGEN LLC, introduced the new 850 E Series purpose-built material handler at the 2018 ISRI Show. The new model features a Tier 4f compliant Cummins engine. The 850 E continues SENNEBOGEN’s focus on simplicity and dependability, achieving exceptional performance through intelligent hydraulic design without complex electronics. SENNEBOGEN’s modular design concept allows customers to order the 850 E with a rubber-tired or tracked undercarriage, or adapted to any other required mounting for gantries, pedestals, rail cars, barges and ship applications. The operating weight for the 850 M is 134,200 lbs. (60,873 kg) while the R-HD unit on crawler tracks weighs in at approximately 146,300 lbs. (66,360 kg). The 850 can be fitted with one of several boom and stick configurations providing a maximum reach of up to 69’ (21m). The new 850 E is also among the first models to feature the latest version of SENNEBOGEN’s popular Maxcab operator station. The updated Maxcab is longer and roomier than its previous iterations, providing more space for the operator. Known for its great visibility, the Maxcab now features joystick travel controls eliminating the steering wheel to ensure an unobstructed forward line of site. Dual cameras for rear and right-side visibility are also provided as safety standard. With SENNEBOGEN’s industry-leading innovative full-guarding on the upper deck, the 850 E provides a safe platform for technicians. As on previous Maxcab designs, the new version includes a sliding door and a catwalk with a handrail for safe, easy entry and exit. The 850 E is supported through SENNEBOGEN’s 100,000 sq. ft. head office, parts warehouse and Training Center in Stanley, NC, where advanced service training is provided to customer technicians at no charge.